View What's on at Golden Horse Casino. Become part of the legacy with the Tsogo Sun Sprint! Make sure you clear your calendar because the legendary Tsogo Sun Sprint is going for its 57th year here at Golden Horse. Since the first sprint took place in 1962, it has become one of the most prestigious entertainment events in Pietermaritzburg. This year the stakes are high, with over R3.7 million in prize money to be won! Make sure you come and experience the electric atmosphere and become part of this iconic event. 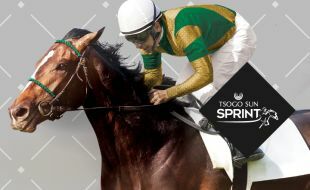 Whether you are a horse-racing enthusiast or just want to enjoy a fun and exciting day out on the track, the action-packed Tsogo Sun Sprint promises to be one of the highlights of 2019! With picnic sites and a new family area for under 18s, there is no shortage of entertainment to enjoy on the day. We look forward to seeing you at the Golden Horse & Scottsville Race Course for this spectacular day of fun, fashion and flair!